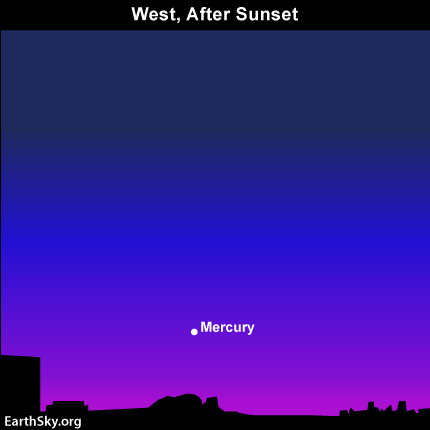 Nineteen degrees east of the sun is not very far, but it is far enough to showcase Mercury as an evening “star” at dusk. For the northern hemisphere, this month stages Mercury’s best apparition in the evening sky for all of 2011. At mid-northern latitudes, Mercury sets about one and one-half hours after the sun right now. At middle latitudes in the southern hemisphere, Mercury sets only about one-half hour after the sun. So why does Mercury stay out so much longer after sunset in the northern hemisphere? It is because the ecliptic – the pathway of the planets – hits the horizon at a steep angle on early spring evenings. However, in the southern hemisphere –where it is early autumn – the ecliptic intersects the horizon at a narrow angle at evening time. As seen from the northern hemisphere, Mercury stands above the setting sun. From the southern hemisphere, Mercury sits to the side of the setting sun. That is why Mercury sets so much later after sunset in the northern hemisphere than in the southern hemisphere during March of 2011.